What puzzles many home workout beginners is how to do pull-ups without a bar. Some try alternative exercises, but pull-ups you can’t really replace and it also isn’t necessary: The world is full of places where you can do pull-ups and chin-ups. Let Hjortur show you lots of examples. 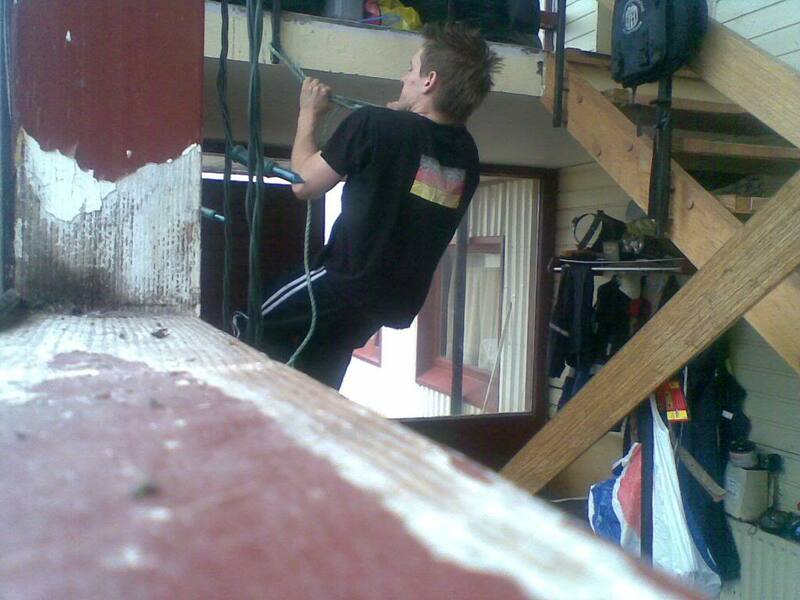 If you can’t afford to buy a pull-up bar or don’t have one at the moment, there are pull-up bars all around you, if you are creative enough: You can do them from beams in the roof, from stairs, ladders, on children’s playground equipment, ships, road-signs, balconies, fences and even light-poles! 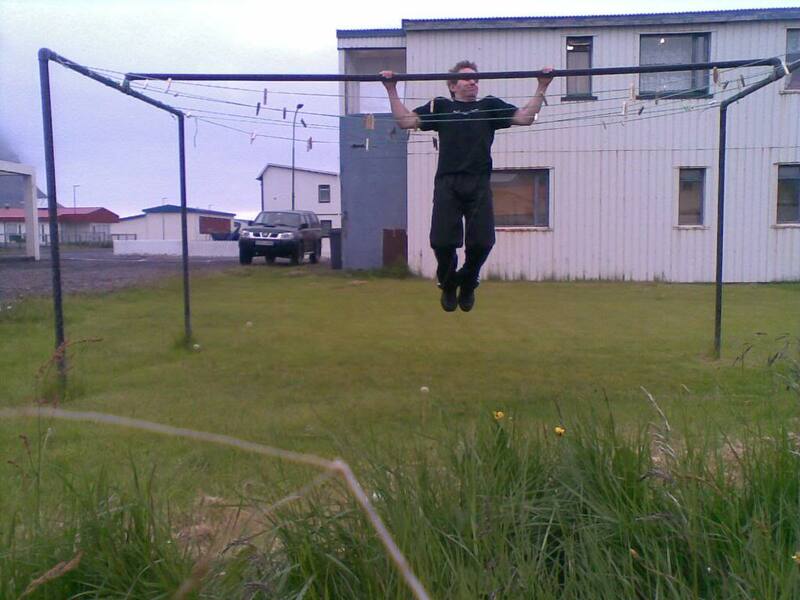 I went on a quest around my house, my yard, and places in my neighbourhood to find pull-up bars, to show people that they really are all around! 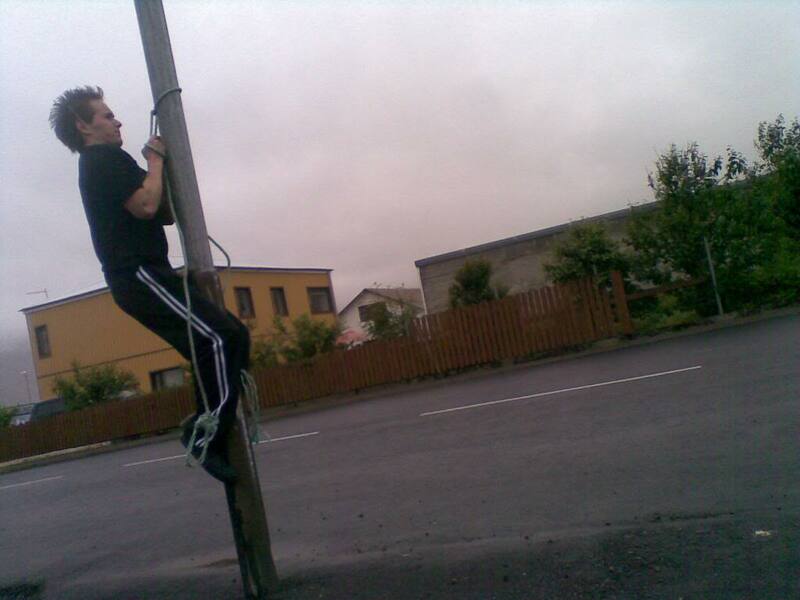 Here’s a few example pictures of how you can use places found all around you to do pull-ups on. 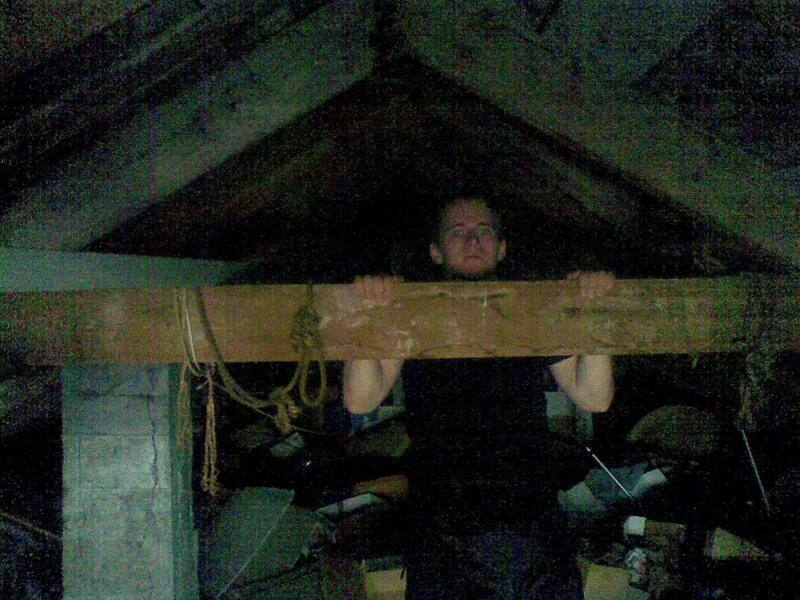 The beam in my attic is just perfect, I used it before I bought my pull-up bar. It’s sturdy and wide, but you may want to wear gloves to prevent splinters. 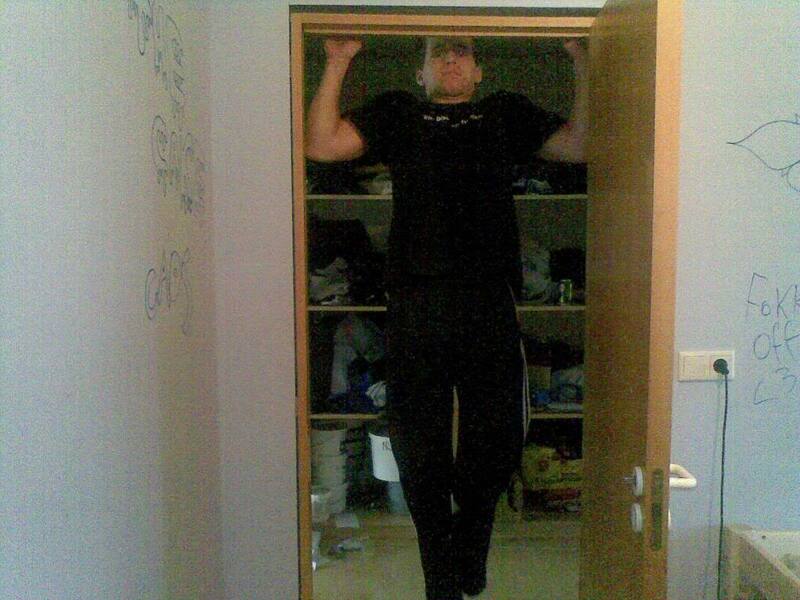 If a doorway is sturdy enough, you can use it to do pull-ups. DO NOT DO CLOSE-GRIP ON THESE; it will increase the chances of the doorway breaking! Mom will not be happy. 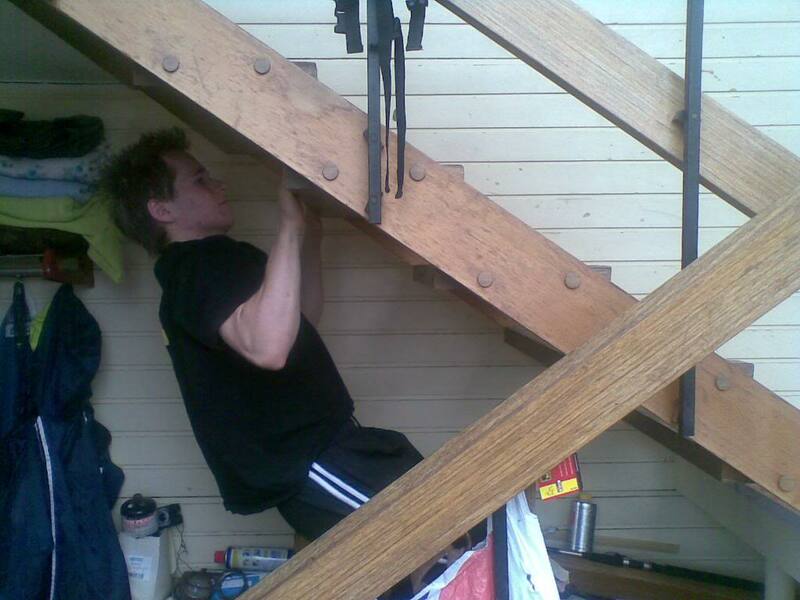 A stairway is a great pull-up bar. The grip is a little difficult, but it’s infinitely better than no pull-ups. Make sure if you use a ladder that it’s perfectly sturdy and doesn’t fall on you. Provided you do that, they are just great for pull-ups. If there’s something above your head that you can accidentally head-bash with (like in my picture), just grab one rung lower than you would normally do and bend your knees, so you can pull all the way up. 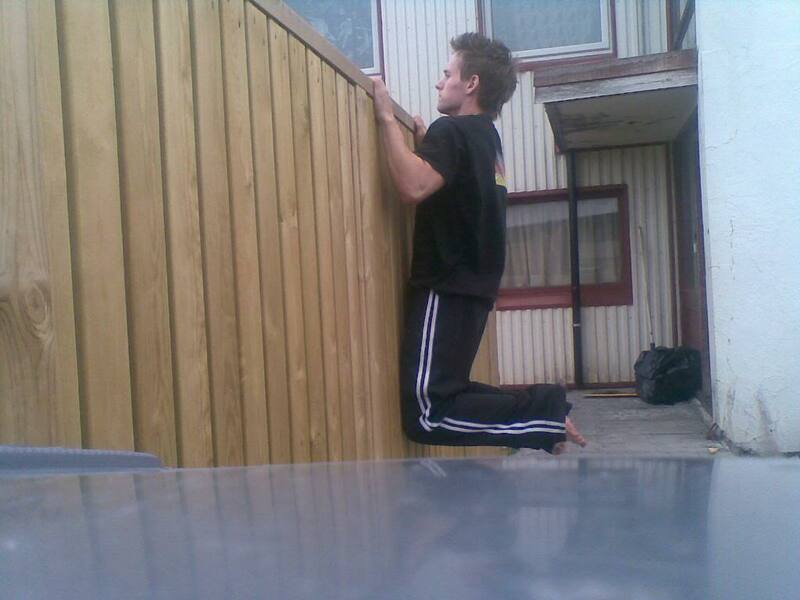 A fence works perfectly, if it’s smooth enough that you can drag your knees along it when you pull yourself up. And don’t worry, your lats get just the same workout, although it might feel silly. This setting also has the advantage that you can’t use your legs to swing yourself up with, which forces you to use your lats to do the exercise. 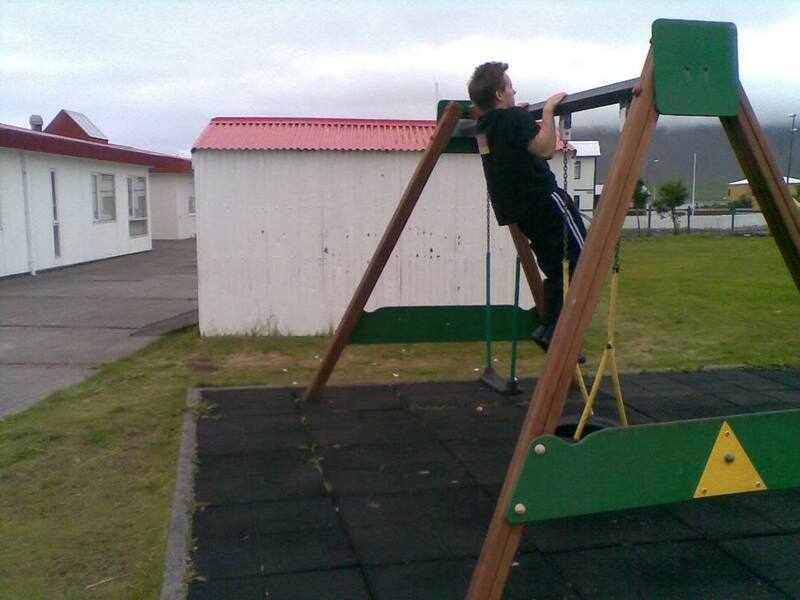 You can also use all kinds of kid’s playground equipment; it’s built sturdy, and you can usually find some kind that allows you to grab hold high enough to do pull-ups. 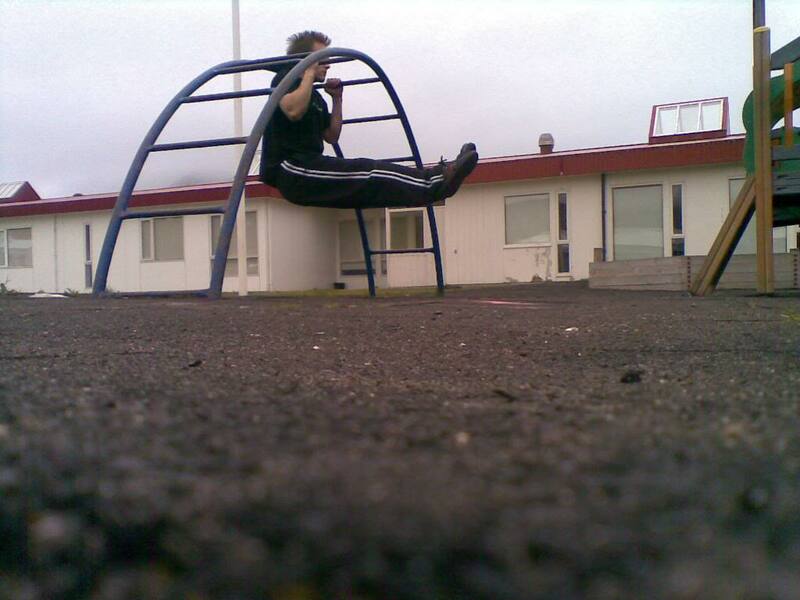 Swings, for example, are a great and common piece of pull-up equipment, I’ve used them many times before. 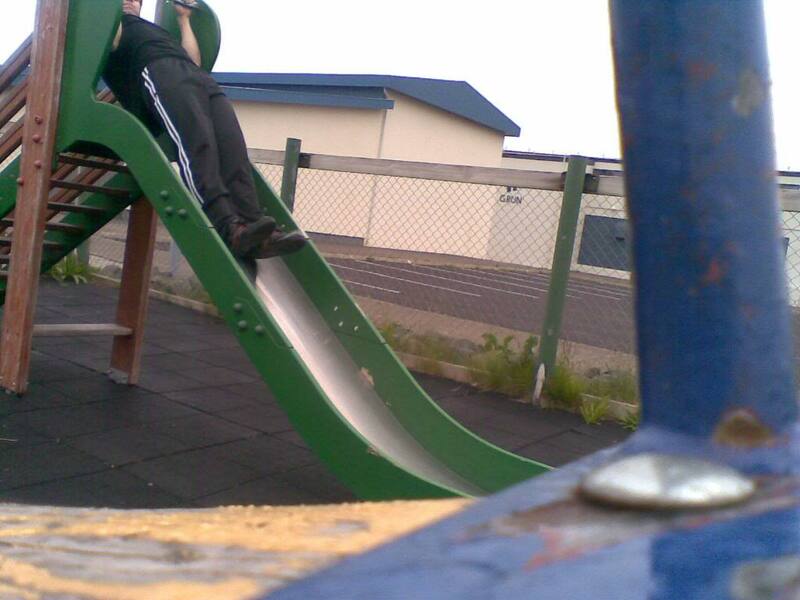 Slides with a bar on top (used to swing yourself down) are perfectly ideal for people who can’t do regular pull-ups, as you can rest your legs in the slide while pulling yourself up on the swing-bar. 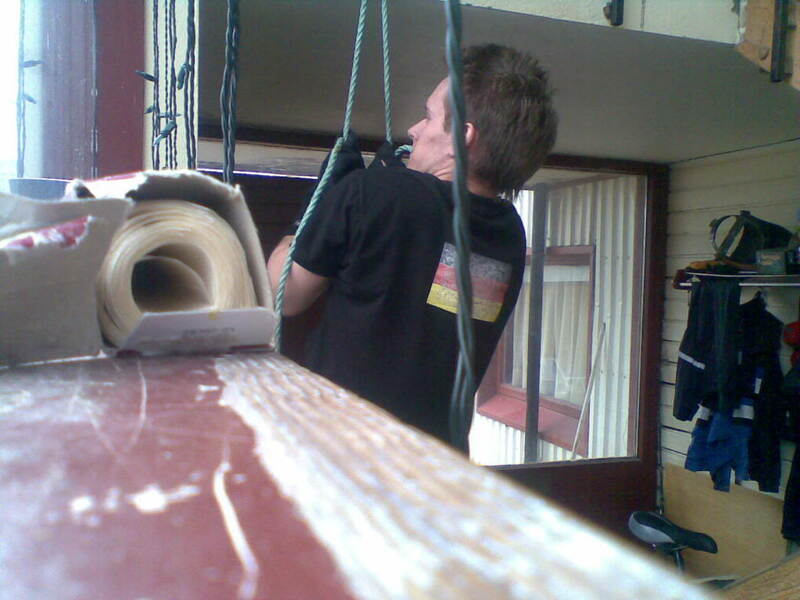 Cloth-line supports are just the perfect girth, height and width for my wide-grip pull-ups! How nice of them to install one just next to my house. Well, you might not all have docks in your backyards, but it just comes to show that any variety of things work! A typical walking rail; I can get a great lat workout with this thing, and it’s never in use early in the morning and late at night (it’s a healthcare center that’s open from 9-5). You’ll also notice that the bar slants and will work one lat more than the other. What I’ll do to fix this is turn around for every new set so it evens out. 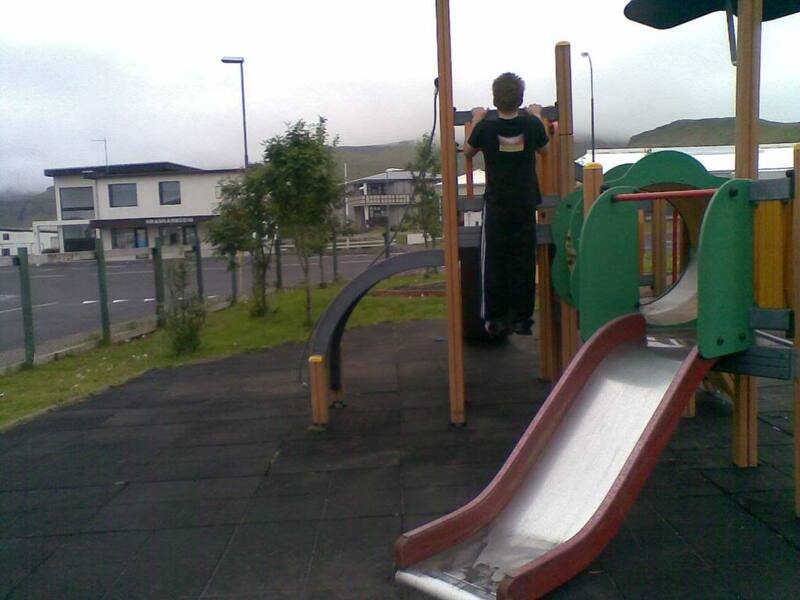 A typical low-setting children’s jungle gym. The high-versions allow regular narrow-grip pull-ups, but here I use the low one for sitting narrow-grip pull-ups, by grabbing consecutive bars and pulling my head up between them. Even a normal table that’s high enough can be used for these sitting pull-ups, although they usually offer a pretty low range of motion. It’s always better than nothing though. 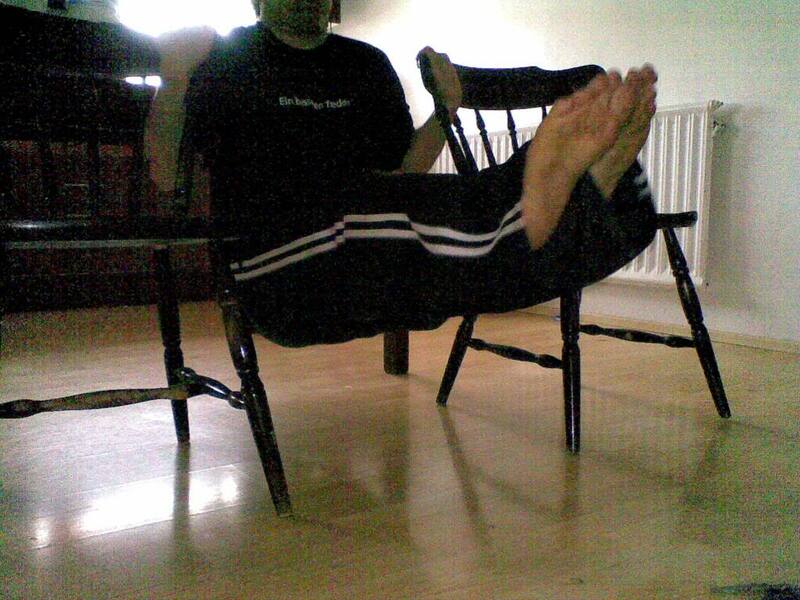 Two chairs are something that everybody should have around their house, and are a great sitting chin-up setting. They require a little balance, but if they’re your only option, I’m sure you’ll get the hang of it. Now you already know lots of ways on how to do pull-ups without a pull-up bar. But you can also create a well-functional pull-up bar from regular objects found around your house. 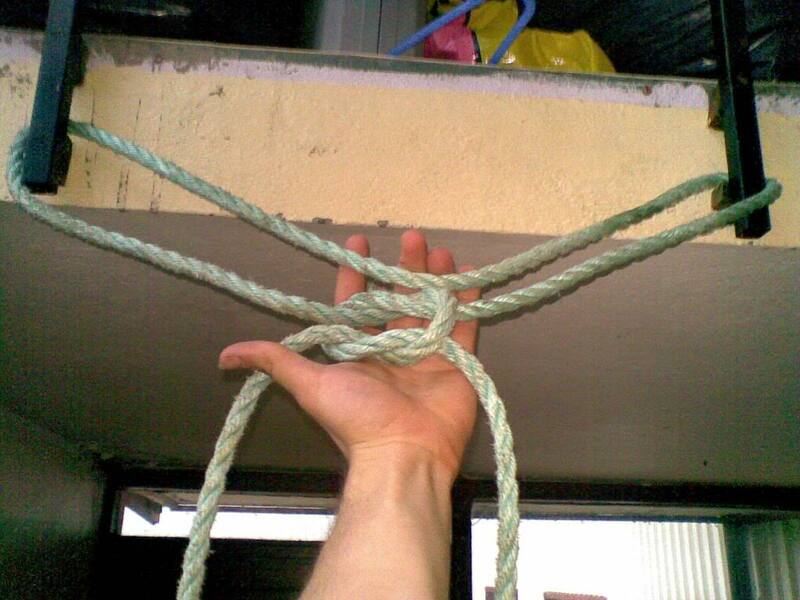 Put the rope in a circle and tie a regular knot, so the rope looks something like this. 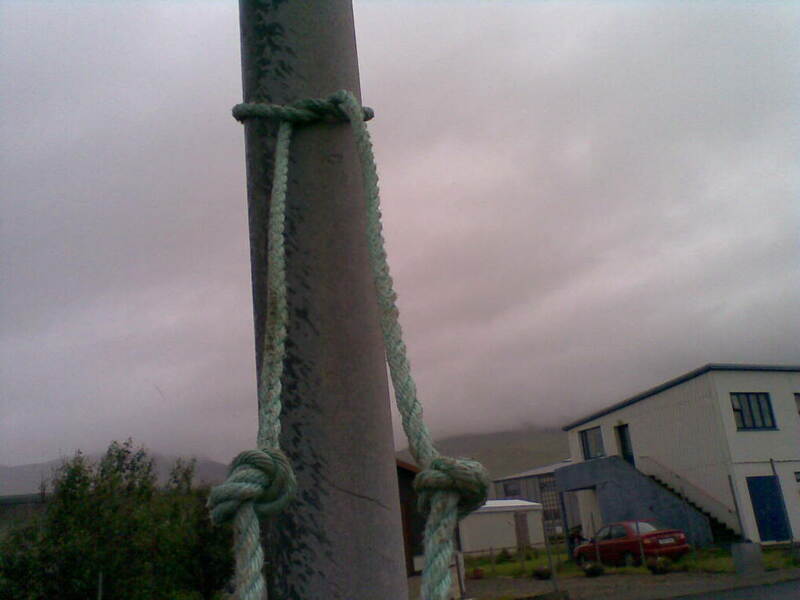 Tie another knot around the one you already made, so the rope now looks like this. Now it will not slide when you hold it, and you can do your pull-ups holding the rope! Here is what it looks like when used. This same setting also works with two vertical poles on a low balcony; just set it up standing on the balcony, and go down afterwards to do the pull-ups. 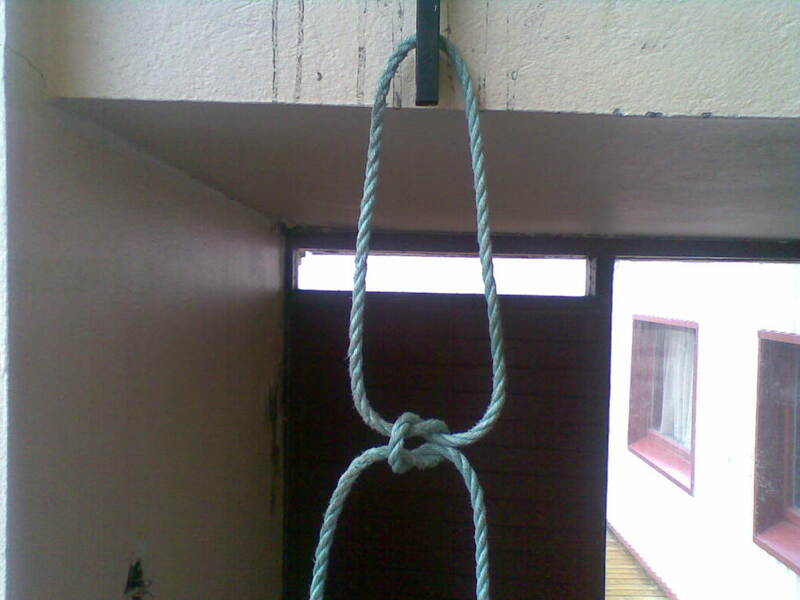 If you don’t have two adjacent hooks to tie the rope around, you can also tie a similar setting around one hook, which will allow you to do narrow pull-ups or chin-ups. The setting will look like this, using the same knot described above. I tried it myself and found that bare-handed, my hands gave out before my lats did, and I don’t have any gloves. But remember, there are no problems, only solutions! I tried putting socks on my hands (clean ones!) and tried it again, and I got a great workout out of this simple setting. So even the absence of gloves is no excuse! Although I imagine gloves are always better. 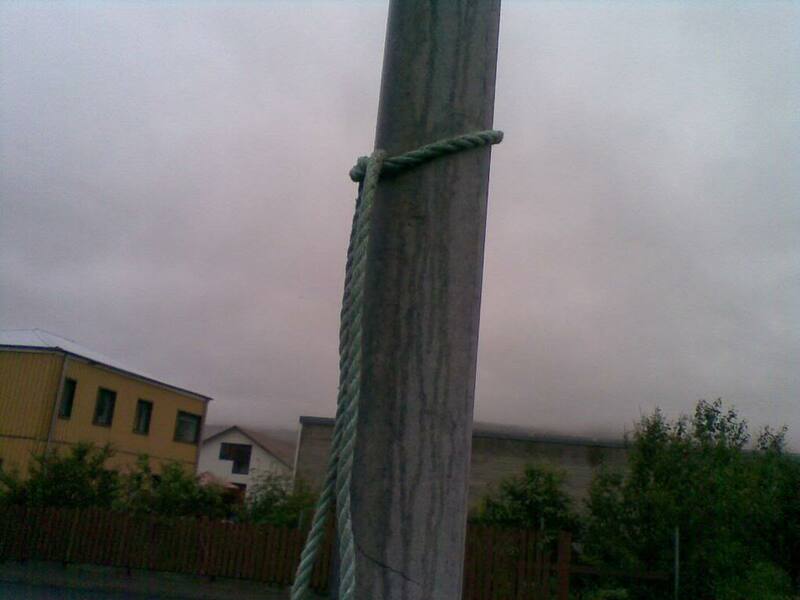 Another simple rope setting is tying the rope around a flag- or light pole or any other sturdy vertical pole. 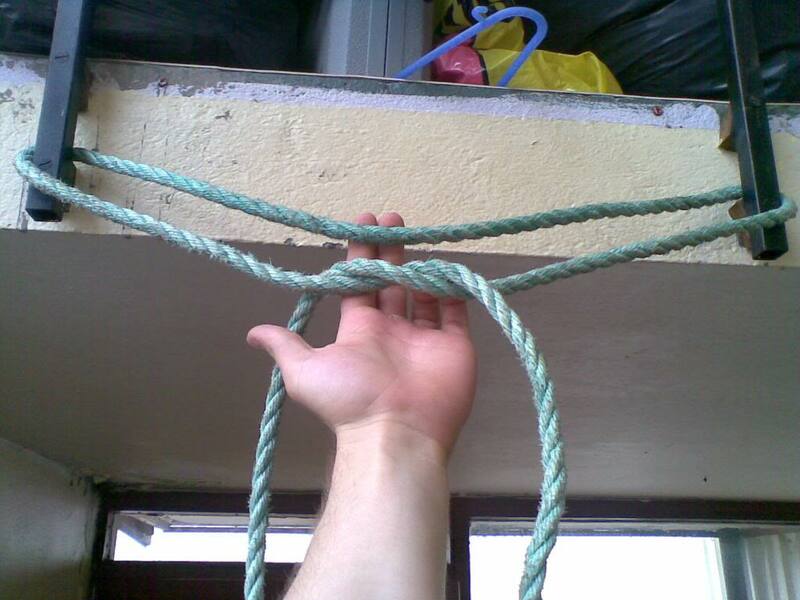 Then you can do your pull-ups by tying the rope around your hands, but not too tight so you won’t damage them. You should hold the rope firmly enough that the loop doesn’t slip and be close enough to the ground that you can fall to your feet without ripping your hands off. You can also tie a knot on each end of the rope to make a better grip and place your hands above each knot, so they won’t slip. If at first the knots aren’t the same length, you can fix it by loosening the top knot, then grabbing each side-knot, and tightening them evenly. Then you can swing the top knot to the desired height. A World Full Of Pull-Up Bars! Youre’ now ready to go and try out new places for doing pull-ups at home and elsewhere. Just remember that whatever you try, make sure it’s safe. 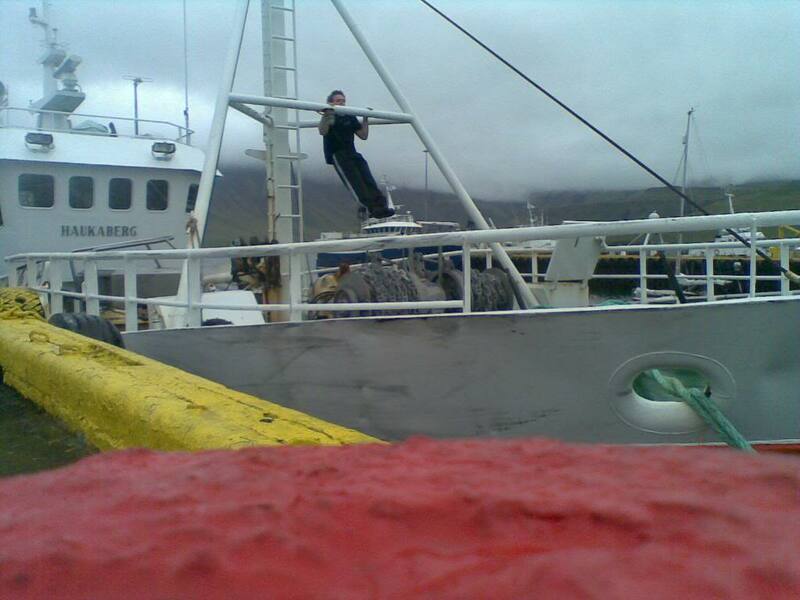 Ropes and hooks, for example, have to be able to bear your weight, while tables, chairs and ladders must support it without toppling. When you first try out a new setting for your pull-ups, make sure about these, so that you won’t damage things or hurt yourself. If you keep this in mind, you too should now have a world full of pull-up bars and can make them part of your home workout program! This article was written by Hjortur, a master at finding alternative ways into fitness and working out. 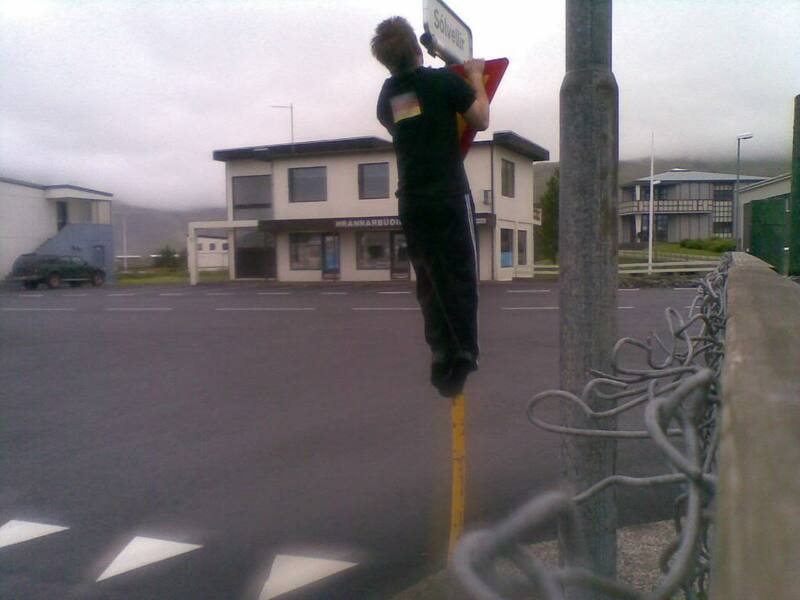 Awesome – excellent job, Hjortur! Please answer me and thank you in advance. 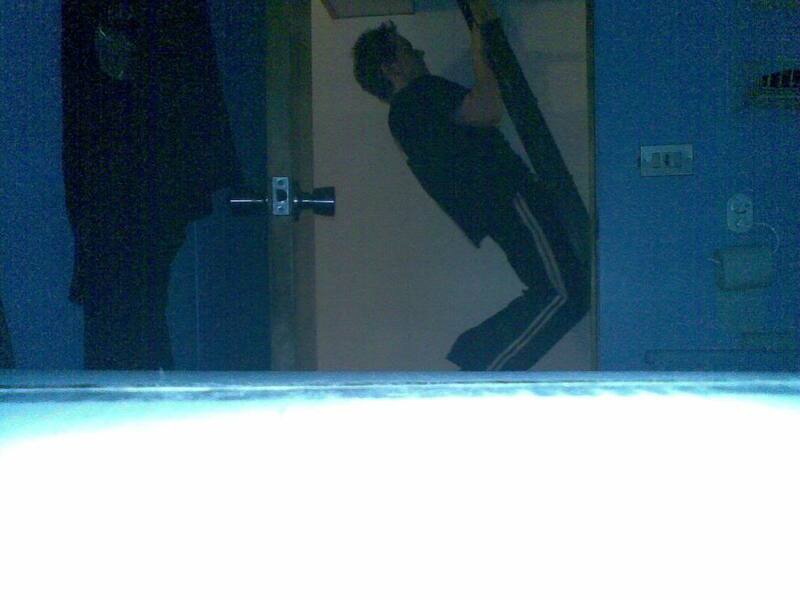 Dear Kareem; doing door pull-ups like these will most likely not harm you, but it might indeed harm the door. Through wear and tear after doing these enough times, the door might unhinge. Do them only if you have absolutely no other options. Try looking around for more pull-up options. Also i have a couple more questions. First of all are body weight squats (like this one http://www.dietsinreview.com/diet_column/wp-content/uploads/2008/09/squats.jpg ) good for a 16 year old teen (which is me). And my second questions is this device useful? http://img.alibaba.com/wsphoto/379674305/Gym-Gyroball-Gyro-Ball-With-LED-Light-No-Battery-Required-Accept-Paypal-Credit-Card-T-T.jpg my dad brought it to me as a present and i don’t know what to do with it. Dear Kareem; you should log on the askscooby forum and ask these questions where you will have a vast team of helpful members and knowledgeable moderators answer your questions. As for bodyweight squats, they will work well if you’re a beginner, but they get too easy as you progress. Try to do get-ups or jump-squats instead when you get stronger. 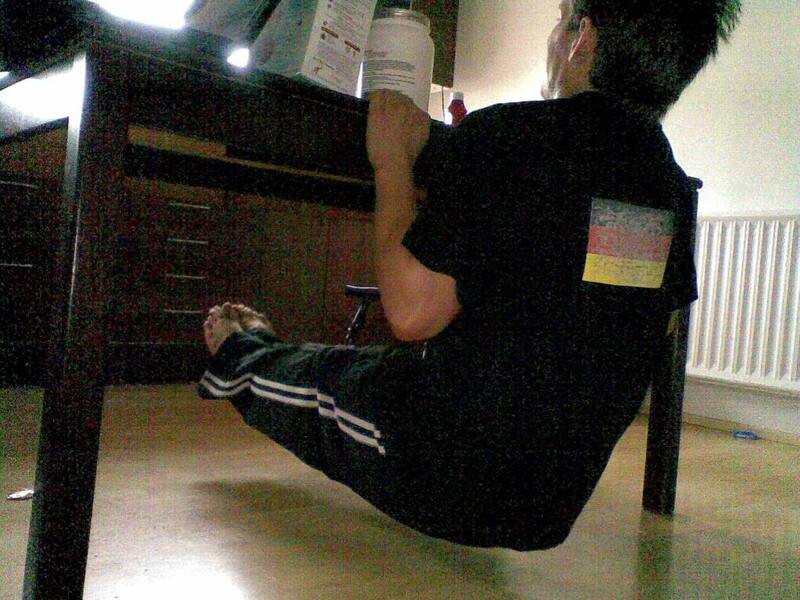 As Hjörtur said, after a while, bodyweight exercises get too light and you have to make things more difficult. Hello, I’m from the forum. Another option would be to use two mini towels to do a towel pull-ups. Many ways to do it but there are two that I can think of. One is to put each towel around that thing (in the picture above where the rope is put around) and then hang from each towel. Another way is to put them each around a beam and then hang from there. This also works out your grip. That’s what The Rock does in his workout.. I checked on YouTube. Yep, that is an excellent method to combine back- with grip training! Hey I have the perfect beam that I can use but I’m afraid that it might not be strong enough and might break so how can I be sure I won’t break it? 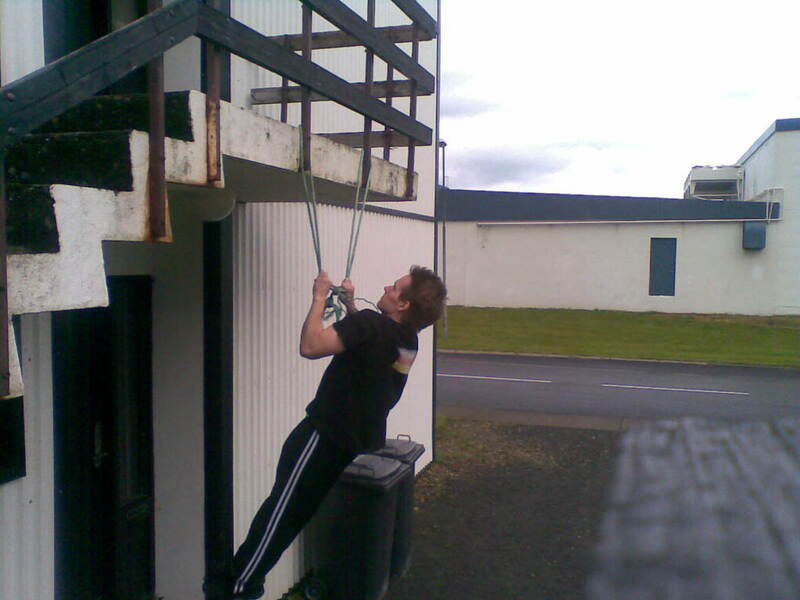 When in strong doubt about a pull up bar thingy, don’t use it. I mean you can use it once, but It will break eventually. Exactly. If there is no way of testing the stability without endangering oneself, it’s better to be safe than sorry. Great ideas! Helped a lot. Now I need to find something sturdy enough in my house. Heah Dmitry, I have been giving this thought, but want to do it right if we do it. Very Good article, one you should add is a door, it’s practically like with the fence, it moves a bit, but you can improvise sOmething from that happening, only downside, like with the fence: You’ll feel kind of silly. guys I have a problem, here is the thing I want to enlist in the army so I started busting out some numbers of push ups along with my workout and every time I was bored or something like that but then I started to have shoulder pain and my doctor says it is just a balance problem with my muscles so he told me to do those rope things that you tie up to a door or something like that if you know what I am talking about. So I started to read that you must balance it out with pull ups but now whenever i do a pull up my shoulder hurts, it is nothing serious but im getting frustrated i use to be able to do alot of pull ups and also i am feeling a little down side on my push ups too!!! i use to be able to do 60 and now 50, and im getting fatigued alot faster then last year. HELPPP My kind sir, also about pull ups I have to work on some i have a found a great place to do it but it hurts when i do so. ANY TIPSSS????? Great post, love these inventive ways get your pull ups done without spending anything, especially the rope pull ups!